Glow stick , glow stick baton and glow stick necklace. How to add glow sticks to clothes or costumes. Glow stick wholesale packs for large parties or events. ​Glow Sticks are a good alternative to fireworks in places where they are not allowed. The are safer for kids than using sticks that spark or other fireworks. There are so many things that you can do with glow sticks. Kids and adults love them for parties and events when they are out in the dark. 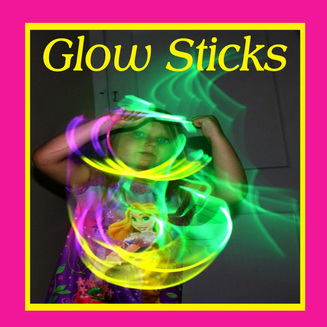 They are great to use indoors also for a glow party. People like to wear them, play with them and use them for making decorations. They can be worn as bracelets, necklaces, glasses or even added to clothing and costumes. Glow sticks also provide some extra safety when used on bikes, dog collars or just carried in your had when walking after dark. Have a look at this video with all of the dancers dresses in black and have different color glow sticks attached to their outfit. This is a set of 100 premium glow stick bracelets with 100 connectors included. There are 5 colors including pink, green, blue, yellow and orange. These will glow 8-12 hours. These also are available in larger whole sale packs. You can get these in 300, 500 and 1000 piece packs. They still come in boxes of 100, but you get the quantity discount. This is also a 100 piece set of glow glow sticks with connectors. It also comes with a glow ball flower kit, glasses kit and more. This set includes 25 glow sticks that have a glow time of 8+ hours. For larger parties or events, this big pack with over 500 pieces has enough items for up to 50 people. The colors included are purple, green, orange, red and yellow and the glow time is 8 -12 hours. I think using the longer 22 in glow stick will work better for costumes since you will have fewer pieces in all to make long runs for arms and legs. You may still want to use the shorter sticks if you want to make smaller designs such as the ribs for a skeleton costume. But either way, as in this demonstration, they are taped down and you can use connectors to make a piece as long as you want. These also come in different colors and a color assortment pack. Use long glow stick for making necklaces using the connectors that are included. They can also be used for decorating any thing that you want to add an extra glow to. These are the same brand as the fist set of 8 inch glow sticks that I show on this page. If you are going to be using long and short sticks, you may want to get the same brand so they will be the best match. This pack will have 50 assorted colored stick and connectors. Partiers shine on at his fun run. Having an event after dark is a good way for participants to stay a little cooler and just look at how much extra fun they have with all of their glow in the dark sticks. Foam covered glow sticks are thicker around than regular glow sticks. They are more like waving a baton. They come in muti colored sticks or in solid colors. Shake up some fun with a 16 inch foam light stick. It has red, green and blue LED lights with different flashing options. 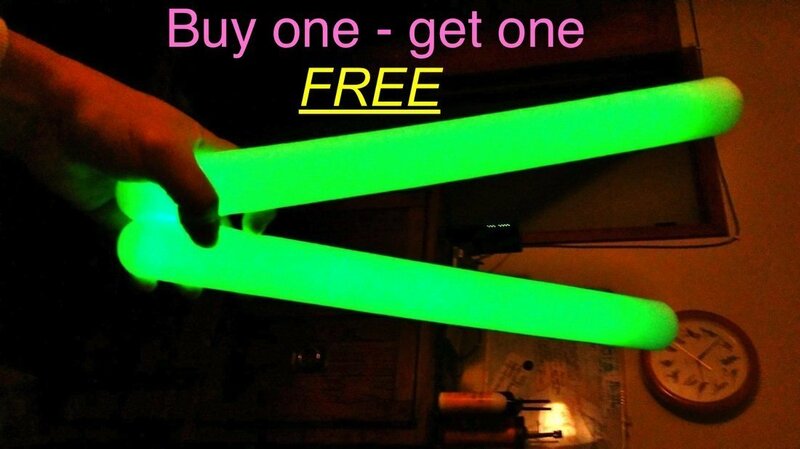 These are solid colored glow stick that are 16 inches long. There is a buy one get one free offer on these sticks. There are additional ordering instructions for selecting the colors you want. They come in either red, green, blue, orange or yellow. The REALLY BIG GLOW STICK you've been looking for!